You can customize port number values that will be used for communication between backup infrastructure components. For more information about Veeam Backup Enterprise Manager used ports, see Used Ports. 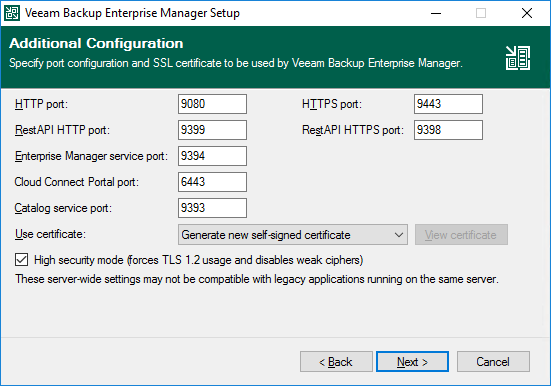 Provide HTTP and HTTPS port numbers and select the certificate to be used by Veeam Backup Enterprise Manager. This certificate is needed to establish secure communication with the Enterprise Manager website using HTTPS (default port 9443); Veeam plug-in for vSphere Web Client and RestAPI client also will use this certificate to receive data using HTTPS protocol. If the setup wizard does not find an appropriate certificate to be used, it will generate a self-signed certificate. Click View certificate to review the details of the selected certificate. To enable TLS 1.2 secure connection protocol for the network connections select the High security mode checkbox. This mode enforces TLS 1.2 protocol and disables weak ciphers setup option using system-wide settings, and thus may be not compatible to other 3rd party software running on the same server. If you are installing Veeam Cloud Connect Portal, you can also provide port number that will be used by browser to access its web site (default port is 6443).